When I started my blog I feel the same way. I always thought that what are the scopes, would I earn or not. But eventually I realized that focusing on the money is not the thing which a blogger should prefer. Yes it's the need if you are engaged in your blog on a full time basis. So what I am suggesting is that you need not to worry about money you just have to focus on the content you are providing to the people through your blog, Money will come automatically. As I have discussed before about the list of affiliate site which can help you monetize. But remember blogging is all about having a lots of lots of & again lots of patience, I mean the more you have it the more it pays you. So if your blog is not earning or having a low income just forget it, go on placing good content on your blog. A time will come when you will earn more than you expected, that's true it's my experience. My blog is also a low income blog but I never gave up. I totally enjoy adding(i.e. writing) new content to my blog and help others with their problems. I don't care about the competitions nor I am afraid of any ranking, what I feel like writing I write it. 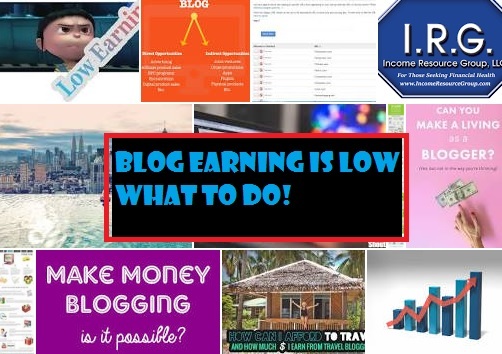 So if you need to earn through you blog just keep writing and write well, so the more the traffic on your site the more will be your income. So in order to get the traffic you need more content so I would suggest you to publish new post at a minimum frequency of 4 to 5 times a week. You can also publish more but remember quality is what your blog need nor the quantity, So write good and worthy content. Don't forget to share this on facebook and twitter and with every one else.